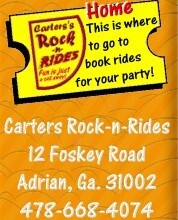 Moon Walks at Carter's Rock-n-Rides....Exciting, fun rides brought to your Party or Celebration!!!!! At Carter's Rock-n-Rides, we understand that it is very important to get the information you need about our attractions in a timely manner. So, when you simply fill out the short form below and submit, we will be notified by email and will reply as soon as possible. Thanks for calling on us! What type of rides and attractions are you looking for? Please add any comments or requests that may help us serve you better! Thank you for your interest in Carter's Rock-n-Rides!